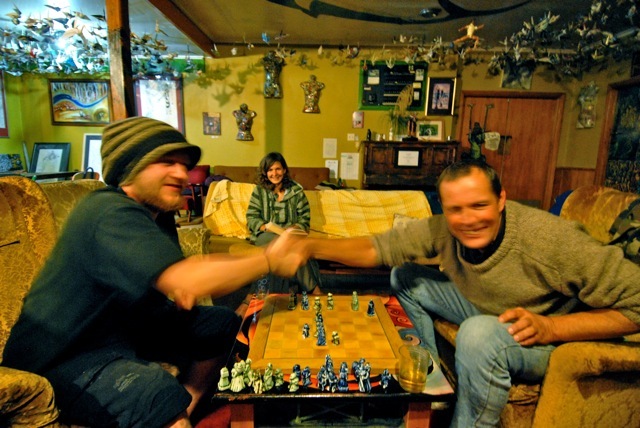 Rongo Chess Pavillion, Karamea, New Zealand: In an atmosphere palpable with excitement, expectation, anticipation and a tinge of fear, the crowd at Rongo Backpackers & Gallery in Karamea were treated to an epic chess battle between titleholder Andreas “Andi” Diller from Germany and local boy Samson Jesus Elijah Lewis Arthur Gordon Jackson, who was desperate to reclaim the Chess Champ title he lost to Diller earlier this year. 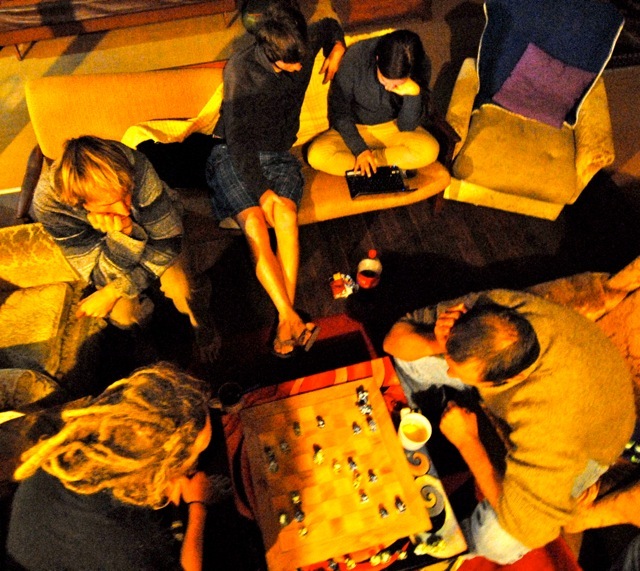 Both contenders opened timidly sniffing each other out and nervously testing the respective form and ploy of their opponent across the chequerboard. Jackson appeared particularly stressed as the weight of Rongolian expectation, the goal of restoring personal pride by reclaiming the title he lost to Diller in February 2012 marked his face with deep lines. Beads of perspiration dotted his forehead on a mild Autumn evening in the Democratic Freedom of Rongolia as he approached the game with and fierce determination and intense concentration. 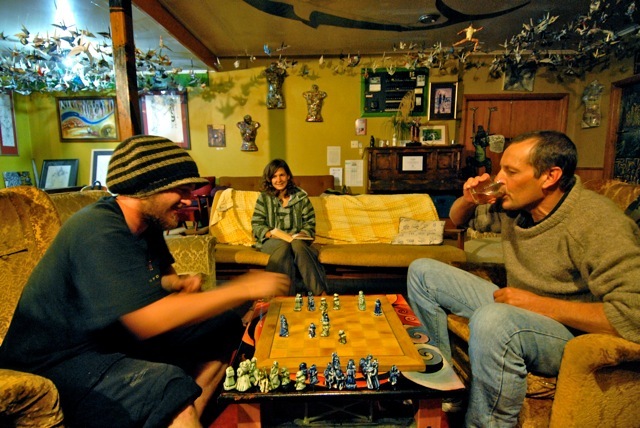 Andreas "Andi" Diller (left) and Samson Jesus Elijah Lewis Arthur Gordon Jackson vie for chess glory at the Rongo Chess Pavilion at Rongo Backpackers & Gallery in Karamea, New Zealand. Conversely, Diller was relaxed, convivial and calmly focussed as he joked with the crowd and openly taunted his opponent with the confidence of a Champion who has nothing to prove. Diller worked the room and was clearly the crowd favourite, whereas Jackson was all business, stoic, humourless and Russian-like in his approach to the game. Mr Cool Andi Diller and Mr Ice Jackson Square off in the Rongo Chess Pavilion for the Rongo Chess Champion Title Match on Thursday April 19, 2012. In Game One of the best of three, Jackson sought first blood and opened quickly and had a check manoeuvre on his opponent in three moves, Diller managed to avoid trouble and both players then settled into defensive mode with a slow, deliberate approach to the game. Almost an hour in, the board was still evenly arranged and the game was anyone’s for the taking, however, Diller steadily cornered Jackson and eventually forced him into retirement…Game One: Diller. Game Two saw Jackson come our fighting, he was straight into an aggressive attack on Diller’s positions…Diller maintained a defensive stance that was eventually overcome by the relentless attack from the Kiwi challenger Jackson, who claimed Game Two in quick time. Jackson began to win the crowd over to his side. 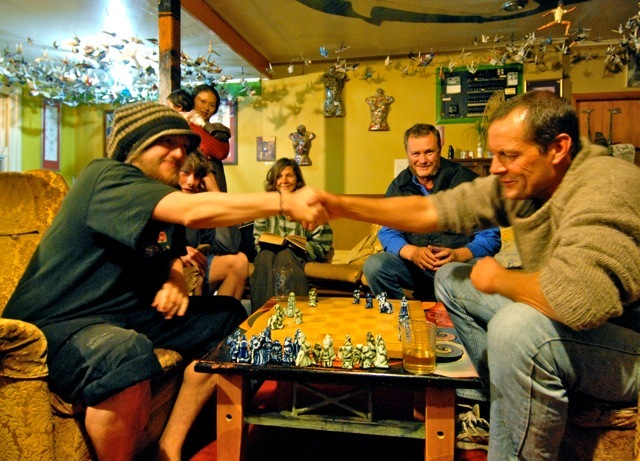 A visiting Australian began plying Diller with fine single malt Scotch whiskey and urging him to remove his hat to show everyone his dreadlocked hair…Diller eventually complied and on removing his hat, the magic of his game seemed to evaporate…Jackson gained the ascendancy of the battle at that point and went into overdrive. Jackson Gains Upper Hand as Hatless Diller Succumbs to Crowd Pressure and Booze. Game Two Jackson: Kiwi Challenger Jackson levels the contest one all and affords himself a smile, the first of the competition for the stoic former champion. 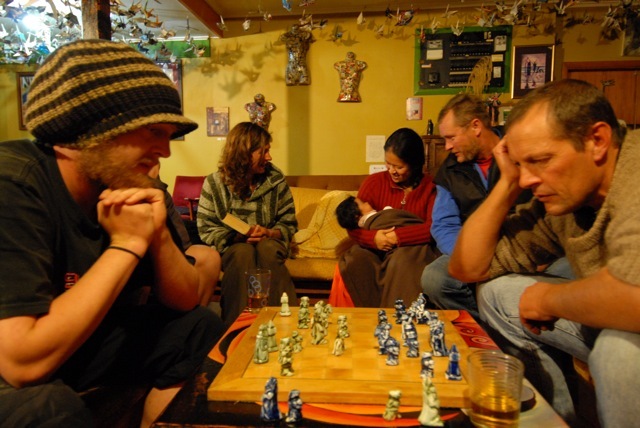 Jackson continued on his winning way, quickly wraping up the third and deciding game to reclaim the title from his worthy opponent Diller, who will return to Germany a loser, but with the knowledge that he was once, albeit briefly, the Chess Champion of Rongolia. The Russian-like Jackson was last seen in a state of drunken undress, upside down in a gutter, covered in his own excrement and vomit howling at the moon as he celebrated his win in the unique way fans all over the world have come to expect of him. Diller is on his way home to Germany, defeated but with the respect of the people of Rongolia…well done and thanks Andreas, you are not the champion, but you are a champion. 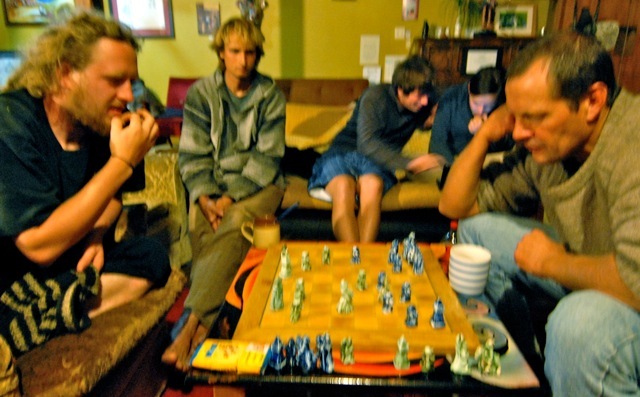 Samson Jesus Elijah Lewis Arthur Gordon Jackson reclaims Rongolian Chess Championship. 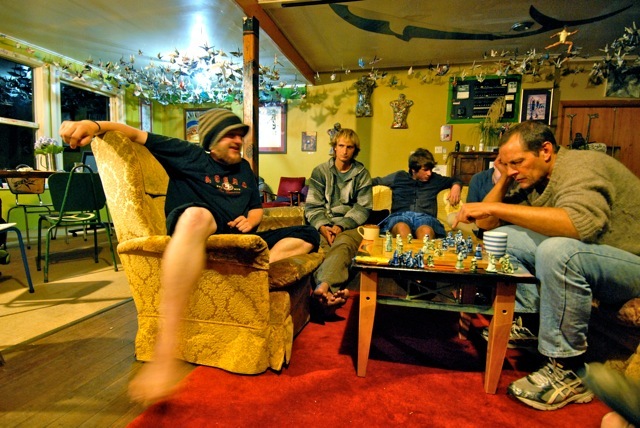 This entry was posted in Uncategorized and tagged backpackers, Chess, German, hippy, karamea, Kiwi, New Zealand, Rongo, Rongolia, South Island, tournament, West Coast. Bookmark the permalink. Didn’t the Hun learn anything in the Western Desert? When Rommel lost his hat at El Alamein it was all over. Thanks for your comment Peter…and you’re quite right, however, as Germanic peoples are our best customers, perhaps we shouldn’t refer to them in a derogatory way…not good for business what, what! Haha, nice coverage of the event there Paul! Glad to see not too much blood on the chess board after this gripping battle of chess! Nice coverage of this mighty clash here Paul! Great too see not too much blood was spilled on the chess board! Der Furhrer iz not happy! Schweinhundt un schwarzkopf dumbkopf!!! Andi vill be executed by ze firing sqvad upon his return to ze farterland! !